This week, the junior high school was fortunate enough to have two special visitors from overseas. Marie from France and Karen from the United States spent a week in Nigawa Gakuin, taking part in day-to-day classes and activities, their first ever experience in a Japanese school. 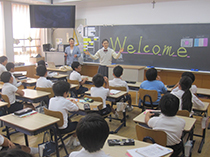 Besides attending classes, their school experience also included after-school Naginata and they both gave presentations about their home countries in the English conversation classes. We trust that both girls will return to France and the US with fond memories of Nigawa, and we look forward to spending more time with them next time they visit us. Thank you! 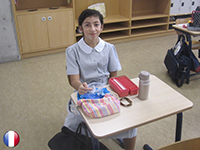 After spending an unforgettable 10 months studying in the U.S., Wakana has finally returned to Nigawa Gakuin – now as a 3rd grade student. Many of us were following her adventures through the monthly reports and photos posted on the exchange noticeboard, but now we have an opportunity to hear first-hand about the many experiences she had during her studying abroad. In addition to her core studies, Wakana was involved in many extra-curricular activities such as drama and dance, enabling her to forge strong friendships with both students and teachers and Saint Mary’s. This experience helped her to improve her English communication skills and become more independent. 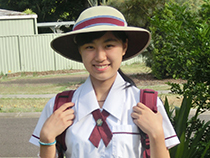 As Wakana takes on her next challenges in the final year of high school, she will also be helping our next students prepare for upcoming exchanges to the U.S. and Australia. 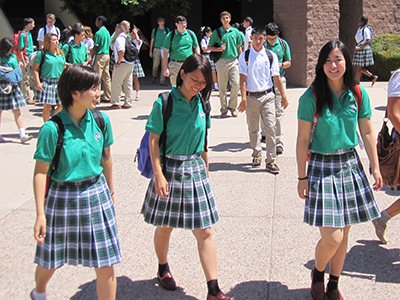 Our warmest regards and thanks go out to everyone at our sister school Saint Mary’s Catholic High School in Arizona and her host family for their wonderful support. 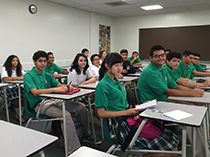 The new academic year has just begun at Saint Mary’s Catholic High School, our sister school in the U.S. This year, one second grade high school student has taken on the big challenge and responsibility of representing Nigawa Gakuin for a one-year study abroad experience. 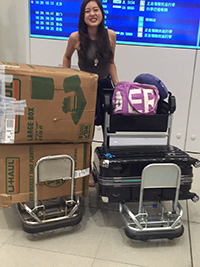 After completing a 6-month orientation period in Japan, Wakana arrived in Phoenix, Arizona in the middle of the dry summer heat of 44 degrees! Just a few days later, she joined her new friends and teachers, in full uniform, to commence classes – of course, in English! 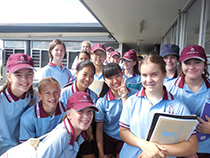 Wakana’s classmates here at Nigawa have already had an opportunity to talk with her during an English class video chat, and we are looking forward to seeing regular updates and photos on our international noticeboard. Good luck Wakana! From San Jose to Nigawa! This week, the junior high school is lucky to have a special visitor from the United States who is visiting Nigawa during her summer vacation. 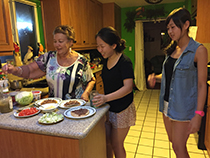 Marisa’s family is Japanese, but she was born and raised in San Jose, California. School life in the U.S. is very different from that in Japan, and this week will be an opportunity for her to experience first hand these differences. Marisa gave our English class today a very informative presentation on her usual school life, much of which was very eye-opening for our students. We hope that Marisa enjoys her short time at Nigawa and perhaps comes back one day for a longer visit! Welcome back from the U.S. 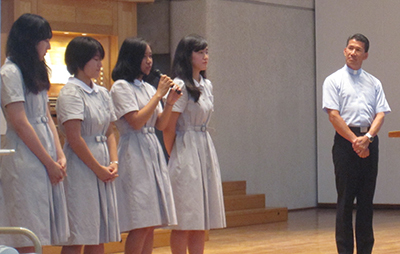 This month, four students who spent 10 months studying in the U.S. (Arizona and Hawaii) returned to Nigawa Gakuin. All of us here at Nigawa had been following their adventures via the monthly reports and photos posted on the exchange noticeboard, and now we have an opportunity to hear first-hand from the students themselves about the many unforgettable experiences they had during their studying abroad. Not only did this experience help them improve their English skills, they have returned to us as more mature and independent 3rd grade students, ready to face their next big challenge as “jukensei”. In addition, they will also be helping our next students prepare for upcoming exchanges to the U.S. and Australia. Our warmest regards and thanks go out to our everyone at our sister school Saint Mary’s Catholic High School in Arizona, our new friends at Sacred Hearts Academy in Hawaii, and the host families who supported our students during their time in the U.S. This January we welcomed another exchange student from our sister school in Australia, Padua College. Callum comes to Nigawa having had a keen interest in Japan and the Japanese language for several years, and we are looking forward to helping him make the most of his one-year stay with us. 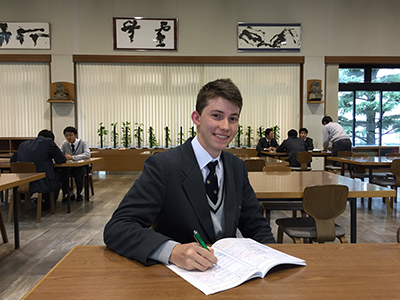 In addition to being highly motivated to improve his Japanese skills, Callum is also planning to take part in many extra-curricular activities at school and wants to see as much of the country as possible. For Nigawa students, this is yet another exciting opportunity to learn more Australia and Padua College, as well as a chance to improve their intercultural communiucation skills. 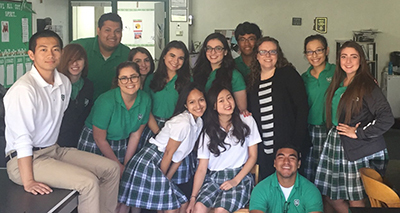 Our 3 students currently studying at St. Mary’s Catholic High School in Phoenix, USA, have entered the second half of their study-abroad year. After completing their final exams in December, they had two weeks over Christmas and the New Year to spend with their host families and friends. Please check out the international noticeboard at school for regular updates and photos! Anna, our first exchange student from St. Mary’s College Ipswich in Australia, has completed her one-year exchange at Nigawa. 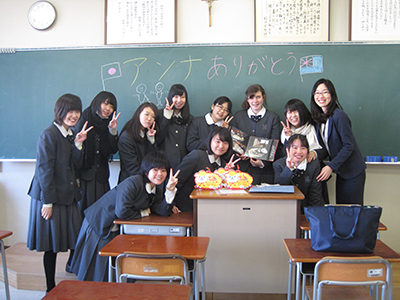 During her experience, Anna took part in all facets of Japanese school life, including club activities and our school trip to Italy. Her enthusiasm and love of Japan has left a lasting impression on her classmates, teachers and host families, and we are looking forward to maintaining contact via skype until we can meet again in person. Anna, good luck with your first year of university in Australia. We hope to see you again soon!